The Cook’s Shipyard site occupies an area of approximately 3.0 Ha. It is located to the south of Anglesea Road and comprises a shipyard with hard standing and derelict buildings on the western two thirds and grassland on the eastern third. It is bounded by the River Colne to the south, Wivenhoe town centre to the north and west and a flood defence bund to the east. Historically, the shipyard with it’s associated buildings occupied the site between 1897 and 1983. A gasworks site including two gas- holders occupied the northwest corner of the site from 1897 to 1967. A sewage pumping station was located in the north west of site between 1936 and1958. Part of the former Cook’s Shipyard area was historically used as a waste disposal site for demolition and construction waste, industrial process waste and inert waste. 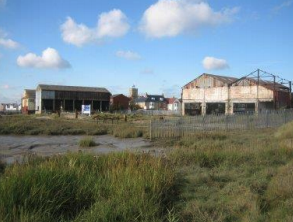 It is understood from historical records that the waste disposal site covered the central section of the Cook’s Shipyard site and the land of owned by the Environment Agency. The waste disposal license held for the site expired in 1988. The former Gas Board site has been the subject of previous site investigations by WS Atkins and RSA Geotechnics Limited. The site was remediated and validated by WS Atkins in 2001. The former Cook’s Shipyard site was investigated by Knight Environmental Limited in 2001, by RSA Geotechnics in 2003 and more recently by Knight Environmental Limited again in 2005. The results indicate the principal contaminants of concern in soils are arsenic, copper, lead, nickel, zinc, polyaromatic hydrocarbons and total petroleum hydrocarbons, primarily associated with the Made Ground on the site. Monitoring for soil gases within the gas monitoring wells indicated elevated concentrations of soil gases.